The United States Virgin Islands, consisting of St. Thomas, St. John and St. Croix, have everything one could want in a Caribbean vacation. St. Thomas is the busiest and most-developed of the three, with a bustling cruise ship port, world-famous duty-free shopping, and many elegant resorts. Reached by ferry from St. Thomas, nearby St. John is small and serene, offering a wide variety of activities to outdoors enthusiasts. Thirty-five miles to the south, the largest island, St. Croix, provides the ideal mix of her two sister islands, with two pastel-painted towns to visit and a wide range of accommodations. Because the U.S. Virgin Islands area territory of the United States, no passport is required. 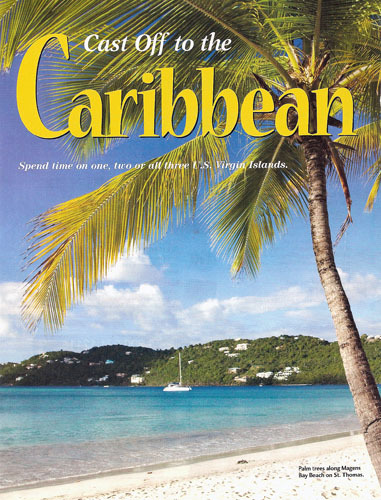 And thanks to frequent air service and lots of cruise ship calls, it's easy to get to the U.S. Virgin Islands. Choose one island or go island-hopping. Plane and boat service make it easy to spend time on one, two or all three islands. From beautiful beaches to one of the world's great cruise ship ports, St. Thomas has something for everyone. It all starts with Charlotte Amalie, where a centuries-old port greets cruise ships and tourists. Visitors can shop 'til they drop or explore an incredible amount of U.S. Virgin Islands history right in town. St. Thomas is a Caribbean shopping mecca. Options include local art, jewelry, china, linens, liquor, and much more. The hundreds of shops along Waterfront, Main, and Back Streets are packed with merchandise. Other shopping possibilities include the cute alleys in between the major streets in Charlotte Amalie, Vendors Plaza, Mountain Top, Tillet's Gardens, Paradise Point, and Havensight Mall out at the cruise ship dock. On the history front, the Visitor Information Center, located in Emancipation Square, is the place to start a walking tour of Charlotte Amalie or get information about sightseeing throughout the island. Fort Christian is one of many Charlotte Amalie highlights. This national landmark was built during the 17th century and is the island's oldest building. The Synagogue of Beracha Veshalom Vegmiluth Hasidim (Congregation of Blessing, Peace, and Loving Deeds) awaits. Situated at 15 Crystal Gade, it opened in 1833 and is the second oldest synagogue in the Western Hemisphere (Curacao's is the oldest) and the oldest synagogue building in continuous use under the American flag. Tillet's Gardens provides a wonderful contrast to shopping in Charlotte Amalie. This local artists' gallery features a wide variety of work including colorful silk-screens. Drake's Seat is a famous overlook that marks the spot from which Sir Francis Drake watched ship movements in the area. The view to the east is of the British Virgin Islands and Drake's Passage, with the stunning scene of Magens Bay and Mahogany Run to the west. Thanks to two-thirds of the island being kept in its natural state as a national park, St. Johns natural wonders are ready for outdoors-oriented people. Although a rental car is a good bet for sightseeing in St. John, there are also many tours. The taxis, which are typically open air medium-sized buses, also offer a wide variety of island tours. Cruz Bay, St. John's capital, may be the quintessential small Caribbean town. Situated on the pristine bay, visitors will find shopping, dining, and watersports. The town also offers wonderfully eclectic shops, as well as many other shopping, dining, and adventure outfitter spots. The National Park Visitor Center right in Cruz Bay provides a number of guided tours on and off the island. There are snorkel trips, coastal walks, birding trips, and the popular Reef Bay Hike. The rangers also offer many other programs. Heading out of town, lucky St. John visitors will find some of the finest scenery in the Caribbean. Caneel Bay, Trunk Bay, and Cinnamon Bay are surely some of the prettiest beaches in the world, thanks to the lush hillsides, stunning sand, and sparkling water. Almost every St. John tour includes a stop at the Annaberg Plantation ruins. The 18th century sugar plantation features an interesting self-guided walking tour and great views. It is administered by the National Park Service which often offers educational programs. Once adventurers have explored the natural beauties of St. John on land, the wonders continue on and in the water. World-class watersports possibilities include snorkeling in crystal-clear waters, scuba diving, sea kayak tours, windsurfing, boating, fishing, and much more. Whether relaxing on a sun-soaked beach, spending a day sightseeing or trying a new sport, visitors will love the variety of activities available in St. Croix. One can start the day with sunrise at Pt. Udall (the easternmost point of the United States) and then pursue a wide variety of activities. Or one can just relax at one of many resorts, hotels, or small inns. For history-lovers, sightseeing takes a distinctly Danish twist on St. Croix. Much of the island's history revolves around Danish landmarks. From the Old Customs House in Christiansted to many old plantations throughout the island, St. Croix's history has withstood the test of time. One favorite Christiansted history stop that will probably endure for all time is Fort Christiansvaern. This bright yellow Danish-built fort, built in 1749, is a National Historic Site. One of the most popular historic plantations is the Estate Whim Plantation Museum. This old 19th century sugar plantation and estate has been restored to its former glory. The house, historic exhibits, and grounds are well worth a visit. For plant lovers, the St. George Village Botanical Gardens is a green gold mine. Set in the ruins of a 19th-century sugar mill plantation, there are hundreds of plants and flowers. There is also an interesting display of all the various ecosystems on St. Croix, ranging from desert-like conditions to the rain forest. St. Croix LEAP is surely one of the most interesting places above sea level in the U.S. Virgin Islands. Located in the lush rain forest, this eclectic workshop for local artists features a wide variety of mahogany pieces. It's the perfect place for an unusual St. Croix souvenir. Nearby, the Mt. Pellier Domino Club bar and restaurant is the home of what must be the world's most photographed pigs. Though the beer-guzzling pigs now drink non-alcoholic beer, it's still a sight to behold (and photograph). Be sure to linger for a cold drink, some great local food, or a look at the perpetual dominoes games played by locals. The drive along the north coast is one of the region's finest routes, with incomparable views of the shoreline and the shimmering Caribbean. This area offers nice beaches, varied accommodations and some of the best shore diving in the Caribbean. In equally historic Frederiksted, the friendly townspeople welcome lots of cruise ship passengers, many of whom will return for a longer visit after their day on St. Croix. On the watersports front, the crystal-clear Caribbean beckons visitors with a wide variety of things to do above and below the surface. Hotels and outfitters can help with snorkeling, scuba diving, boating, fishing, windsurfing, parasailing, sea kayaking, and much more. Many say the Buck Island Reef National Monument is more than enough reason to visit St. Croix. Snorkelers on excursion boats can enjoy the shallow reef and marked sightseeing snorkeling trail. The excursions out to the reef are popular, professional, and possibly one of the Caribbean's best adventures. Of course, there are also lots of inland activities to pursue. Along with several golf courses, the possibilities include tennis, horseback riding, island tours, and more.